How can we see the cross in our digital age? It’s the normal response to virtually any question nowadays. There’s that long, rectangular box, empty, just waiting for you to type the object of your searching. Anything from chopsticks to Chia pets – Google will find it for you in often less than a second. But is that the best way to find an answer? How do we know the first page is the one we want? Going through the returns is like sorting through junk mail. Which one is the one I need? Which page is trustworthy? And then if you do find one, you’re attacked and distracted by buttons and links and pictures and images and pretty soon five hours go by and you completely forgot what you were looking for. A hundred years from now, perhaps we’ll look back at this time in history as the age of the device. Or information. One hardly knows what’s more all-pervasive – our devices or the information within them. We’re swimming not only in a flood of information about anything and everything, we’re also drowning in an ocean of ever-changing, hand-held electronics and information storage and retrieval systems. Thumb drives, hard drives, pads, phones, laptops, desktops, software, blogs, e-mails and a host of other digital media inundate our lives. We’re squeezed by the press and throng of the world which bears down on us like an angry task-master Pharaoh and his army as we stand on our shores of silicon looking across a vast, impassible sea of information and information technologies. What do we do with all of it? How do I know what I ought to know and where and how do I find it? How indeed ought we to wisely negotiate the depths of the digital sea before us? Where’s the dry ground upon which one may safely walk through it all? We need a strong east wind. A miracle. A Savior. Someone to help us sort through the deluge. Google – the noun or the verb – has “shaken” the way which we process information and the way we learn. Let’s briefly discuss this for a minute. What you may not know is that Google’s search engines are powered by logarithms which attempt narrow down the information for which you’re searching. Google uses a system called PageRank which essentially rates pages on the web. A site may have a PageRank of 3. But a site with a PageRank of 4 is ten times more popular than a page with a ranking of 3 (10^3 = 1,000 vs. 10^4 = 10,000). Larger the PageRank, the closer to the number-one spot a page will be. So, for example, if you’re going to Google “RCS TALON” Google’s PageRank will anticipate what you’re looking for by displaying the highest PageRank magnitudes. Turns out the Talon’s “magnitude” is quite impressive – as we are #1 on the rankings out of 407,000 results! Try Googling us for yourselves! Yes, if you aspire to work across the Bay at Google or in any other technology firm, you better pay attention to logarithms, folks. It’s how you find stuff. It’s how we wade through the digital deluge of everyday life on the Internet. You can’t “Google it” without logarithms. In the late 1990s, there was an “information explosion” on the Net which shook the very foundations of our society; a massive, megaton detonation of facts, figures, names, dates, recipes, graphics, pictures, words, books, essays, research, articles, newspapers – a seemingly endless sea of information through which few people had the capability of navigating. 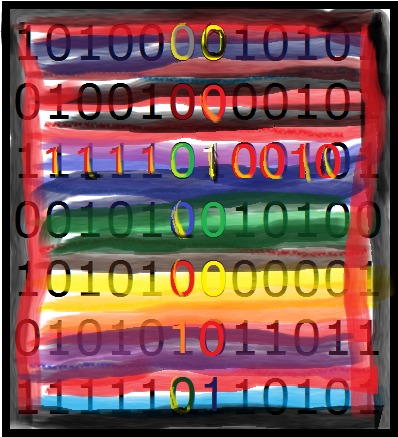 The “Big Bang” of information technology. What the world needed was a filter, a better way to process through all the digital debris left behind by the initial detonation. Along come Sergey Brin and Lawrence Page, two gentlemen from Stanford, not entirely unlike Moses and Aaron, with logarithmic rods and staffs in hand, ready to part the tumultuous sea of data and deliver us from our digital captivity. Google is born. But let’s return for a moment Annie Ellsworth and when she actually sent her text. Yep, you read that correctly. One hundred sixty-nine years ago. Long before cell phones, the Internet, or Mr. Brin and Mr. Page and the advent of Google. So what was this “phone” for which Annie’s father paid thirty grand then? What indeed has God done? How often we ask this very question! The telegraph. A bit before Steve Jobs’ and Bill Gates’, there was Samuel Morse, the father of the telegraph and the first electronically transmitted language of dashes and dots. And perhaps a suitor of the young Ms. Ellsworth. Perhaps it wasn’t electromagnetic technology of the mid-19th century which birthed a communications revolution after all. But love. It’s funny to think that one of the most revolutionary devices of the modern era might have been partially influenced by one man being smitten by youthful beauty. And how often are our phones used in conveying our deepest sentiments to those we love? The telegraph really didn’t belong to Annie, of course. But since Samuel Morse had received such a hefty sum from Mr. Ellsworth to develop his invention it was only proper that Mr. Ellsworth’s daughter should be given the honor of selecting the first message, with, perhaps, some help from Mom. So what’d she say? Ready for this? This little phrase, small as it may be, is God’s Word. It comes from the book of Numbers, chapter 23, verse 23, where we find Balaam, a “prophet” for hire, in the midst of blessing the children of Israel, much to the chagrin of Balak, who’d hired him to actually curse Israel. “I called you to curse my enemies, and behold, you have blessed them these three times,” Balak says in frustration. Balaam simply tells him he spoke what God told him to say. “What hath God wrought?” we too often ask. “God, what have you done? Why has this happened? How could you let this happen?” Sound familiar? But God is in charge and sovereign over the affairs of man, and his inventions. The Ellsworth women perhaps knew this better than we do today. The phrase in Scripture, interestingly enough, is part of a larger blessing Balaam pronounces over Israel, a question the nations will ask regarding God’s chosen people and the things He has done for them. What men such as Balak and Balaam meant for evil or unjust gain, God meant for good (Genesis 50:20). How God actually works good from evil, I’m still not sure, but we know He does (Romans 8:28). And the world will stand up and take notice. There is much for which we can be thankful regarding the inventions we utilize today, even though man often uses them for evil purposes. God has certainly done much for us through the development of modern technologies in medicine, communications, transportation, architecture and industry. But do we as Christians truly acknowledge God’s sovereignty and complete control over the things we invent and use as Annie’s “text” suggests? Do we as Christians really believe that God is in total control of our lives and “de vices” which surround us? Let’s revisit Moses on the shores of the Sinai wilderness for a moment. Panic ensuing. Screaming women and children, and a few cowardly men I imagine, watching an angry, storming army of chariots of Pharaoh approaching, the Israelites realizing they have nowhere to go. Moses has got to be near the end of himself. But he rises to the occasion and tells everyone to cool their jets. 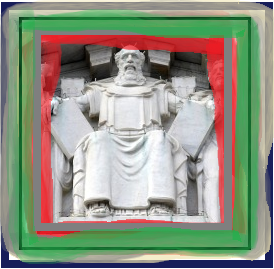 A sculpture of Moses sitting atop the U.S. Supreme Court in Washington, D.C. “What hath God wrought?” had been tapped out on the telegraph from within the Old Chamber of the Court back in 1844. Stand firm and see. Watch what God will do. You can’t do anything apart from the Lord, whatever it may be. The Lord God “will work for you today,” as Moses says. Sometimes the best remedy to our dilemmas is to stand still, to be still, and know that God is God. He upholds, sustains, orchestrates and is Lord over everything from angry Pharaohs to overly sensitive iPhones which cause our faces to unintentionally call or hang up on our friends. 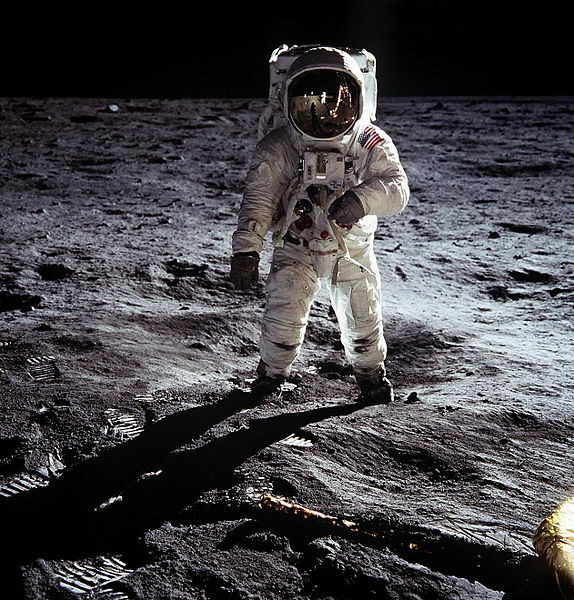 Buzz Aldrin on the surface of the Moon shortly after taking communion in the Eagle. Photo taken by the late Neil Armstrong. Back in the summer of 1969, as Neil Armstrong became the first human being to set foot on the surface of the moon, his fellow astronaut Edwin “Buzz” Aldrin read these very same words of Christ from John 15:5 inside the lunar lander the Eagle, as he became the first human being to take the Lord’s Supper in another world. What, indeed, hath God wrought? We could not have even taken a breath today, let alone have gone to the moon, without the intervening grace and wisdom of the Lord Jesus Christ. Oh, yes, almost forgot. What about the B & O railroad? What’s that got to do with Google, with Annie’s text message or Moses and the Israelites being squeezed by angry Egyptian Special Forces? 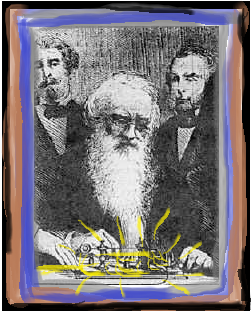 Annie’s message was sent, via the telegraph, to the Baltimore and Ohio railroad company in Baltimore, Maryland from the Old Chamber of the U.S. Supreme Court where Samuel Morse and several eager guests witnessed the transmission first hand. So we see in a unique sense, history almost repeating itself in a way. Here in 1844, another sort of for-profit entity (in this case a railroad company) which ran its “iron chariots” across the landscape for a price, receives a message of God’s omnipotence from the ancient chambers of Heaven. Stand still. The battle belongs to the Lord. “What hath God wrought?” echoes across the land once more. Whether it be Pharaohs and their iron chariots trying to enslave us or false prophets on their donkeys trying to curse us, “nations” are still in the hands of God and are still witnessing what God does in our lives. Are we prepared to give a defense for the hope that is in us? Hold that thought for just a moment and then lets get briefly get back to the logarithm and consider a simple dictionary definition. “Log,” by the way, is short for the Greek word logos. “Logarithm” is a combination of logos and arithmos or “number”. Like the Lord Jesus Christ. It’s His power which takes our baseness and raises it in His righteousness. It is His power which produces within us His wonderful light and work. It is His power which sustains the universe and everything in it. It is the Word made flesh, who took upon Himself our earthen dust, who sorts through the confusion of Babel and takes the cup of wrath and swallows the deluge from the mouth of the dragon (Revelation 12) on our behalf. How remarkably fitting then, almost jaw-dropping, that it is the “logarithm” at the heart of Google’s search engines; that an intricate set of formulae designed to connect us with the most relevant and important information pertaining to our searching turns out to be something somewhat resembling the invisible attributes of the Lord Jesus (Romans 1:19-20). In one sense, then, “Googling it” might just be the secular equivalent of prayer! Want to “get across the Bay”? Want to cut through the information glut and know what’s truly important, what’s relevant for your life, where true knowledge and information are found? Is this not simply what prayer is? But know that when you hit the “return” on your keypad, in a sense you are “returning” to the One who sustains the universe by the word of His power. The logarithms you set in motion are not entirely unlike the invisible attributes of the Lord Jesus Christ, who sustains and upholds the universe by the word of His power. Stand still and let Him work for you this day. Let Him the rock upon which you build your house amidst the silicon of our technological world. As you engage with technology, seek His wisdom and knowledge first, before you Google anything. And all the things He knows you need will be added to you. November 10, 2013 in Stranger Than Fiction.